US: Charcoal juice is now a thing! The thing: A $9.95 bottle of Juice Generation cold-pressed juice mixed with two teaspoons of activated charcoal. Here, that means the pitch-black powder of heated coconut shells, but activated charcoal can also be made from sources like wood or coal. Also called activated carbon, activated charcoal is incredibly porous and adsorbent. (That’s not a typo—it’s a word that means a wide range of molecules and chemicals stick to it.) That last quality makes it useful in all kinds of contexts, from water purification to gas masks to an application in clinical emergencies like overdoses or poisonings. Dr Maged Rizk, a gastroenterologist at Cleveland Clinic, uses activated charcoal during poisonings to limit the body’s absorption of the toxin. “It’s black,” he says of the charcoal he administers to patients. “It’s this really nasty looking drink. You have them swallow it, and you hope they vomit.” Charcoal’s rather gruesome use as a hospital drink aside, the ingredient has recently popped up in a more glamorous place: the juice world. Juice Generation founder, Eric Helms, saw a glut of beauty products like face masks and pore strips touting activated charcoal as a “detoxifying” ingredient, and he knew many of his customers drank green juice in hopes that it would improve their skin. “If it had charcoal in it, it would be sort of kicking it up a level,” he says. It’s now the company’s best-selling line. The hype: Healthy glowing skin, better breath, improved digestion and hangover help. “Just basically drawing toxins out of your body for improved organ function,” says Helms. “I think that there’s benefits and I think a lot of people feel the benefits,” Helms says. The research: Activated charcoal has been used for centuries in the form of biscuits and supplements for digestive issues. So we know it’s probably not going to hurt you, says Dr Kent Olson, medical director of the San Francisco Poison Control System and clinical professor of medicine and pharmacy at the University of California, San Francisco. He often uses activated charcoal to treat poisonings and even wrote a paper about the stuff — “Activated Charcoal for Acute Poisoning: One Toxicologist’s Journey” — in the Journal of Medical Toxicology. “Generally we think of charcoal as being inert and not having any chemicals in it,” he says, so it shouldn’t cause poisoning. But there’s very little research to back up its use in average people and over a long period of time. 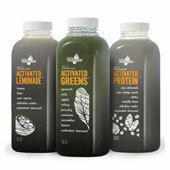 Juice Generation declined to cite any research backing up the health benefits of charcoal…..